Construction work is an unlikely Christmas tradition for most people, but for the 86 volunteers on Maranatha’s Christmas Family Project, it was a blessed way to spend the holidays. From December 20-30, families of all sizes gathered in Chiriqui, Panama, to work on a variety of construction, painting, and outreach projects. The primary project was the construction of a Sabbath School classroom for the San Miguel Adventist Church, built by Maranatha in 1996. Volunteers also painted two churches, which were also previously built by Maranatha volunteers, and assembled two One-Day Church frames for congregations without a proper place of worship. The busy team also managed to completed renovations at an Adventist boarding academy, organize medical and dental clinics, and coordinate children’s ministry programs in the San Miguel community. Maranatha offers two family projects each year: the Christmas Family Project and the Summer Family Project. 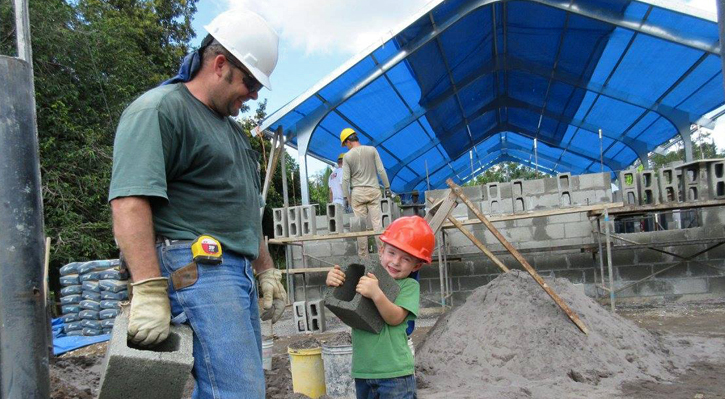 These mission trips are designed to accommodate volunteers of all ages. The goal is to provide an alternative holiday or vacation experience for families and to promote bonding through service. Check out the 2016 Summer Family Project, coming up in June.